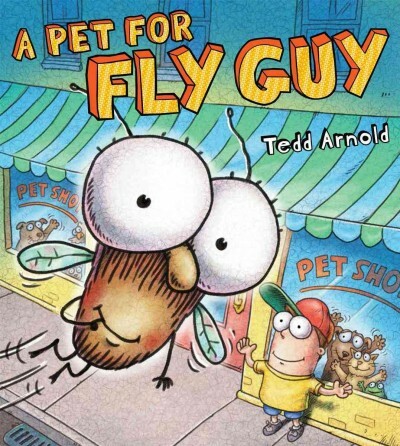 Tedd Arnold's "Fly Guy" books are excellent, but most don't translate too easily into read alouds or a two-person act-out kind of thing. 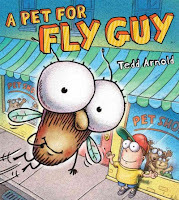 But A Pet for Fly Guy is written as a picture book, rather than an early reader, and the structure is just right. 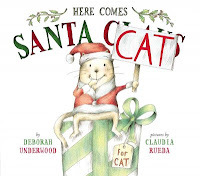 I've used as a storytime read aloud several times, so when Sheila and I had a "Friends" theme for Family Storytime, I thought we could try it with a bigger production. I was Buzz, and Sheila used this cool fly puppet she made some time ago (for Old Black Fly) on a bent up wire hanger for easy control. The story divides neatly into sections. 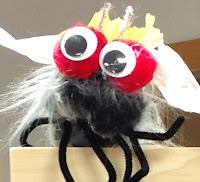 For the first part, Buzz introduces Fly Guy and talks about the cool things they do together. Fly Guy responds with variations of "Buzz," which is all he can say. So we act a few things out: playing chase, hide and seek, and eating snacks. In the next part, Buzz tells Fly Guy about all the great pets kids have. 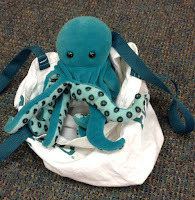 We had three bags with puppets in them and asked one volunteer to come up and show the audience their pet. 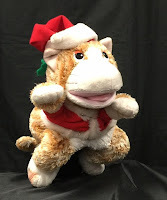 This was a good simple way to do the child volunteer thing, because we could pick them in the middle of the story, and the thing they had to do, pull puppet out of bag and show audience, was simple and cute. Then we sat that first one down and chose another. 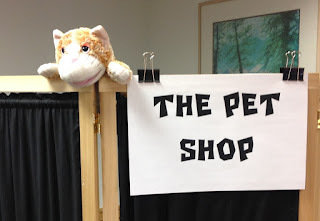 We used a Monkey, Porcupine, and Octopus, but any three unusual/silly animals for pets would do. The next phase is a visit to the Pet Shop, where Buzz tries to choose a good pet for Fly Guy. We just had our backdrop with a Pet Shop sign and I went behind it and came out with a new pet each time. 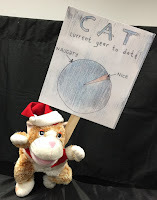 We used Cat, Dog, and Frog; substitutes could work, but they should be pretty typical pets this time. Each time the pet interacts with Fly Guy in a bad way: Dog licks, Cat pounces, Frog chases. We tried to keep plenty of movement going on, and Fly Guy responded with appropriately toned buzz-y noises each time. The final set of puppets are ones that Fly Guy chooses when they visit the Park. We used another backdrop with a tree in front for the park. For these, Sheila took Fly Guy behind the backdrop, then Fly Guy popped out on top with a pet. 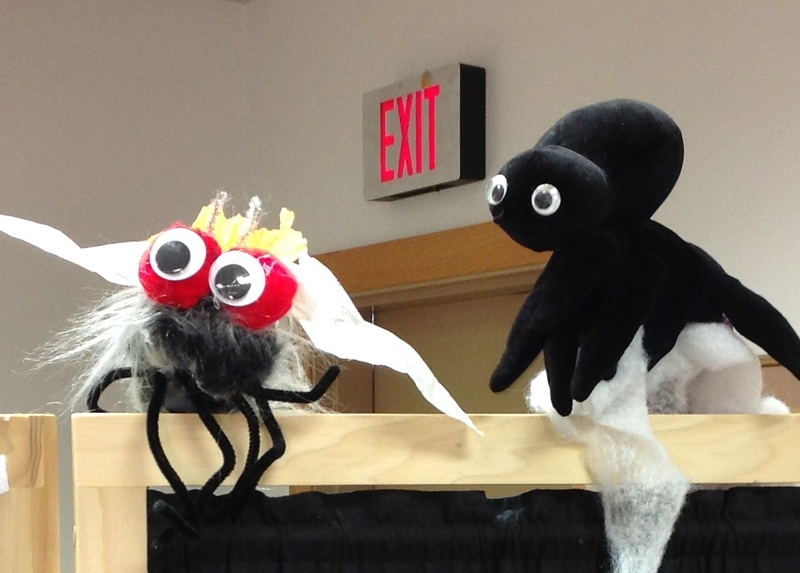 Our choices were Chipmunk (too loud), Worm (too slimy), and Spider (too scary). For the conclusion, it's just Buzz and Fly Guy again, and this time Fly Guy decides that Buzz will be the perfect pet for him. 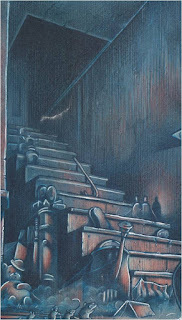 For our annual "Slightly Spooky Storyime" we decided to try The Dark at the Top of the Stairs (the Sam McBratney picture book, not the William Inge play), . 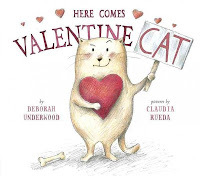 It's been one my favorites suspenseful/funny read alouds for a long time, but we thought it could make a good Act-Out with Scans. It would have been okay, but then Brad added some just right music bits and it really came together. We did it with six(!) people on our big Halloween event, and the rest of the week Terri and I were joined by the newest member of our team, Deborah Gitlitz (our new bilingual outreach librarian, and also an excellent storyteller). It can also work fine with two people, though. 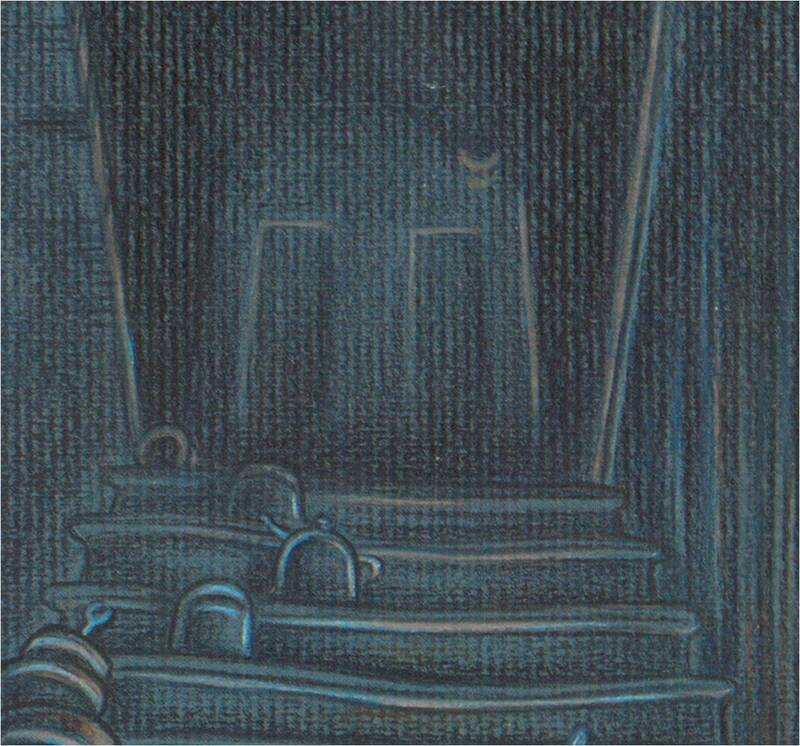 In the book, an old Mouse takes three eager/scared Little Mice slowly up the dark stairs in the cellar, where a monster supposedly awaits. We edited and ad-libbed a bit, but tried to keep a lot of McBratney's excellent storyteller's voice in there. For example, I always love the line where the Old Mouse agrees to bring the mice up the stairs, speaking "as if he knew that sooner or later all young mice will try to see the dark at the top of the stairs." I'm not big on messages in storytime, but it's a nice little nudge to the grown-ups to let their kids do scary things once in a while. 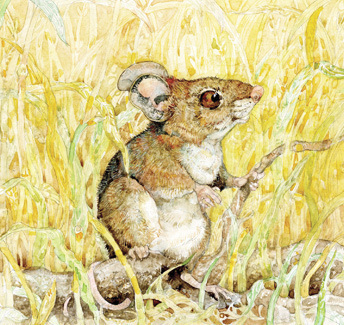 Before they go, the Old Mouse tries to talk them into going to the meadow or swinging on the grass. The music Brad chose for this opening was "Morning Song" from Rossini's William Tell Orchestra, which gives it a nice, light, carefree mood. 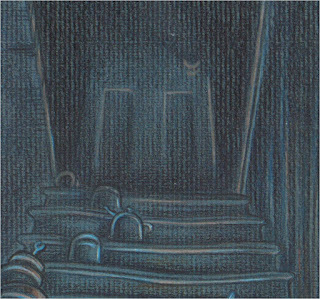 When the story moves into the cellar, the music switches to "In the Hall of the Mountain King" by Grieg, which is just the right amount quiet and mysterious. We only used the kind of tiptoe-y part at the beginning, not the big ending. It's always neat to see how much of an impact a well chosen piece of music can make. 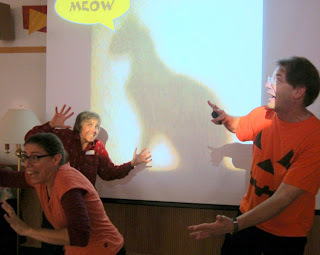 We didn't do any costumes or anything to make us look like mice...we counted on the story and the images to convey that. And as the story progressed, we didn't really try to act out ascending stairs. We wanted to stay facing the audience, or sideways at least. So we just sort of crept in place, making sure to stay on the sides of the screen, without blocking it. The pace of the story works really well with a mostly preschool age audience. The scariness the mice show is kind of real, but also kind of self-generated, so the audience is tense, but not really really scared. 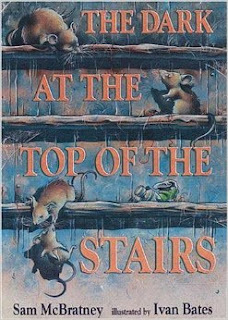 When they get close to the stop of the stairs, with the mice bickering and getting excited, the Narrator can build up to the climax with a louder, more ominous voice: "And then....Something Happened." At the same time, the music abruptly stops. The door opens and the monster is finally revealed. For the "monster," which of course is a cat, we put a black box over the image in the PowerPoint slide, then animated it so it slowly rose to reveal the Cat. Another click added a "Meow" word balloon, plus a sound effect of a real cat's meow. At which point all of us mice kind of ran around in a tizzy for a while and then finally flopped onto the floor "in a jumble and a heap." 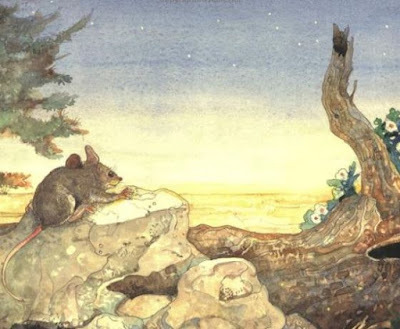 The tale has a very satisfying ending, as the Old Mouse asks the Small Mice where they would like to go the next day and "none of them mentioned the Dark at the Top of the Stairs." 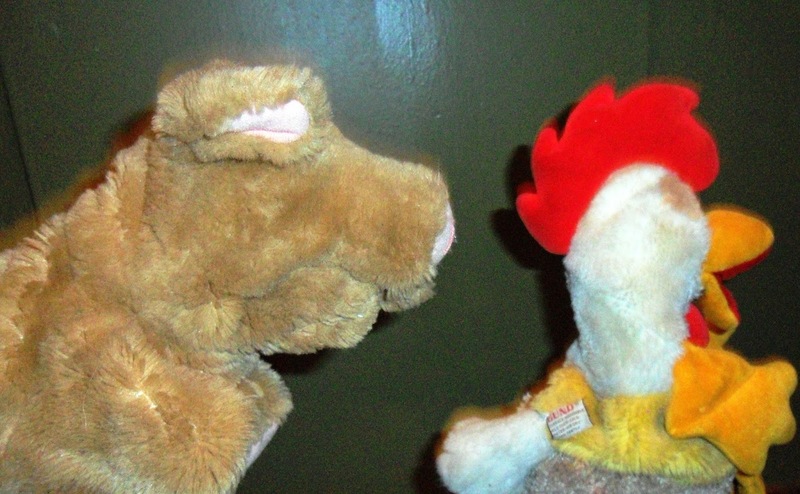 Here's one of the first stories I ever told with puppets. It has a repetitive pattern that's easy to learn (and for the audience to follow), and that pattern builds and twists a bit at the end to make a very satisfying story. When I tell it with puppets I like to it as narrator, as well as doing the puppet characters. So I'll describe Fox catching a bee, then show him doing that. I tell how he "walked and walked and came to a house...." And later it's "off he went, trot, trot, trot, to Squintum's house." I think it's because I first presented as a book and an oral tale, and I just really like Galdone's language. 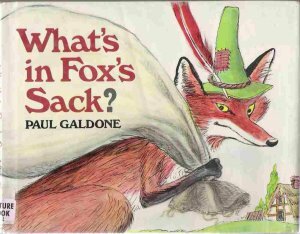 Fox proceeds to meet four different ladies, and asks each one not to look in his sack while he goes to visit his friend Squintum. 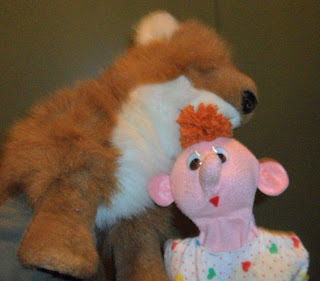 I usually don't use puppets at all for the ladies, I just kind of play them myself, interacting with Fox in character, promising not to look, then opening the sack after all. 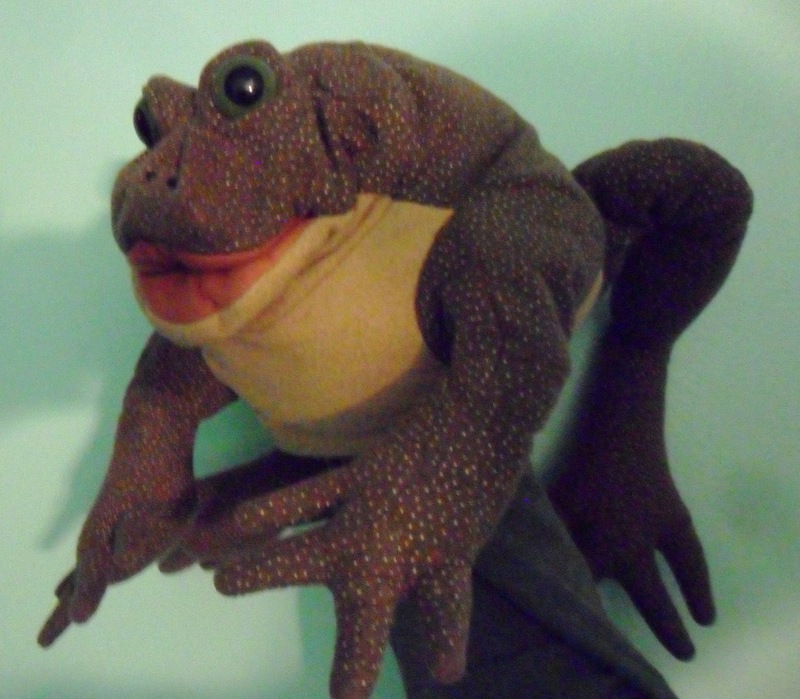 I've done it with four people puppets (I don't have four ladies, so two ladies, two men), but I don't feel it adds that much, and any time I can simplify the prop and puppet handling I usually do. The strong pattern of the story invites some good interaction with the audience. They'll often join in when Fox says "Don't look in my sack!" And you can play up their involvement as the Lady by asking them: "....should I look in his sack?" (response is typically split evenly between "yes" and "no."). 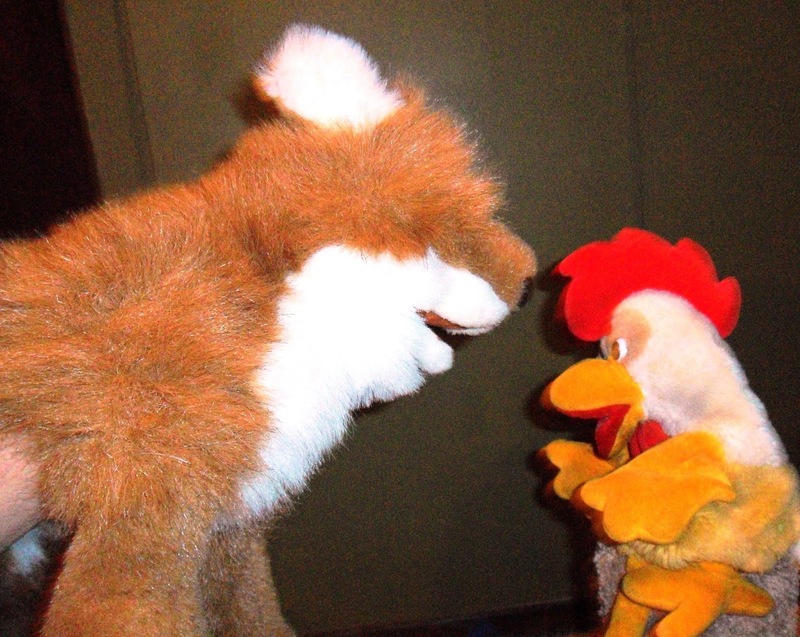 The heart of the story is the narrative and dialogue, rather than action, but there are moments where puppet movement can really help: When each Lady pulls the animal out of the sack when Fox returns and kind of gets in the Lady's face when he says "Oh ho! So you did look in my sack! 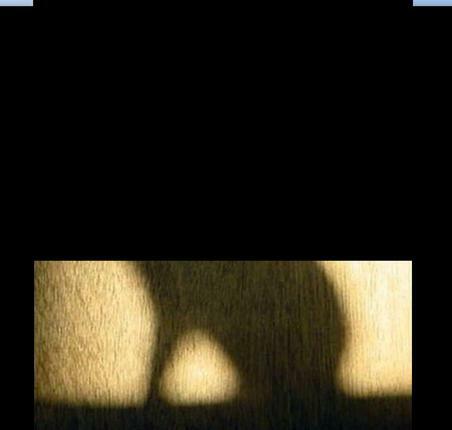 ;" And short simple chases when one animal chases the previous one away. It's always fun to watch the audience's reactions shift towards the end. They've kind of settled into the easy pattern of Fox getting a new animal in his sack each time, but when they realize it's a Child who will be in there, they're not quite so relaxed. And that brief bit of tension drops once they realize that the last Lady is putting her Dog into the sack to fool Fox. You can see a video sample of this story on my Youtube Storytelling with Puppets page. 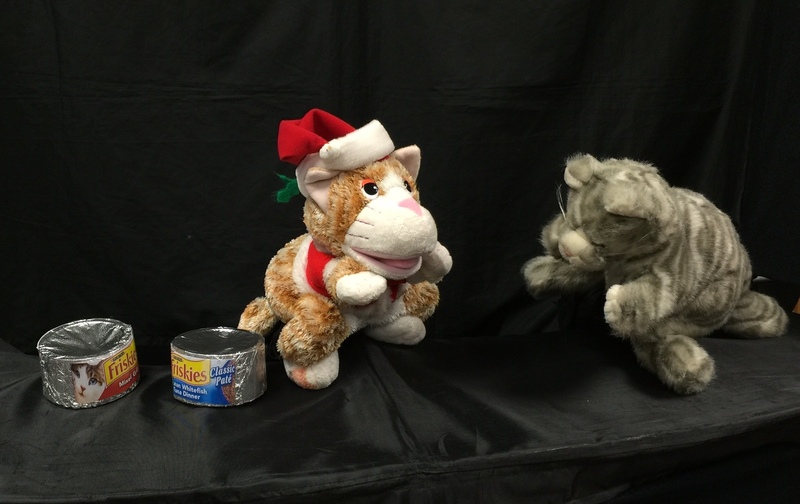 It's a tale that also works great with a puppet stage. When I do it that way, I drop the narration part, so Fox and the Ladies describe what they're doing as the story proceeds. With a stage, you can have some fun with the interactions between the animals, extending the chase scenes, having Rooster hide from Pig a few times, for example. 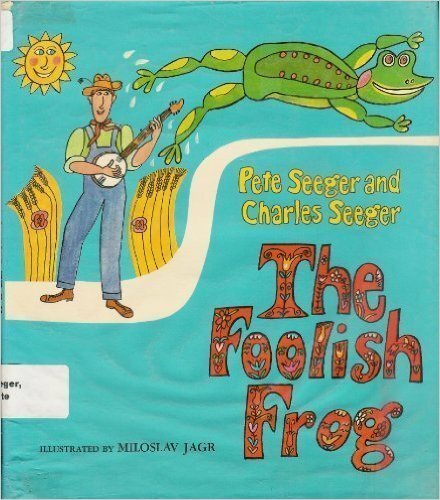 The excellent Paul Galdone version of this tale is out of print and goes for $140+ new on amazon, but Houghton Mifflin Harcourt has brought several of P. G.'s folktales back into print in the past few years and I keep hoping they'll add this one. 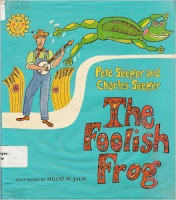 And The Monkey and the Crocodile....and The Magic Porridge Pot....okay, let's just say: all Paul Galdone folktales should be back in print...in hardcover. Jerry Pinkney's version of The Lion and the Mouse has so much potential in storytime settings and we've used it with several variations. 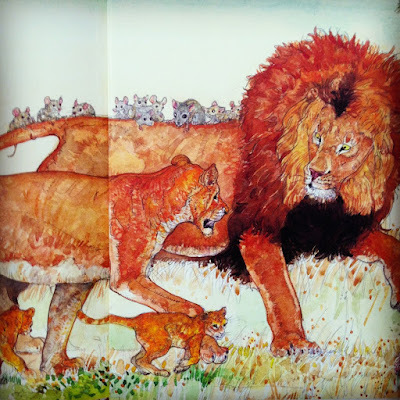 We scan the images to project so they can be seen in our large storytimes. We've done it with barebones narration and simple perscussion to give it rhythm. Another time we had a local string quartet provide live musical accompaniment. For our most recent version I went back to one of my favorites standbys: pop music of the 50s, 60s and 70s. I picked six intrumentals from that time period, and put short clips of each to capture, as well as I could, the mood of the story. For the first part, where day is breaking and we see the lons on the savanah and the mouse waking up, I used 1976's Tomorrow" by the Brothers Johnson (they're best known for "Strawberry Letter #23," "I'll Be Good to You," and "Get the Funk Out Ma Face," but their album cuts were nice too). I skipped the intro bit (0:00 - 0:22) and went to about 1:11. It ends on the page where Mouse first hears the Owl. 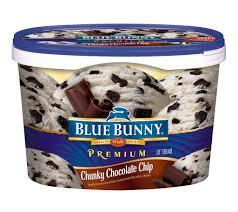 Then Mouse gets chased by the owl, so you need something a little faster. The first 46 seconds of 1963's "Pipeline" by the Chantays fit nicely, even though a mouse running on a savanah is about as far as surfers as you can get. The clip has a nice little mini-fade that we timed to match when Mouse is on Lion's mane, but doesn't realize it. 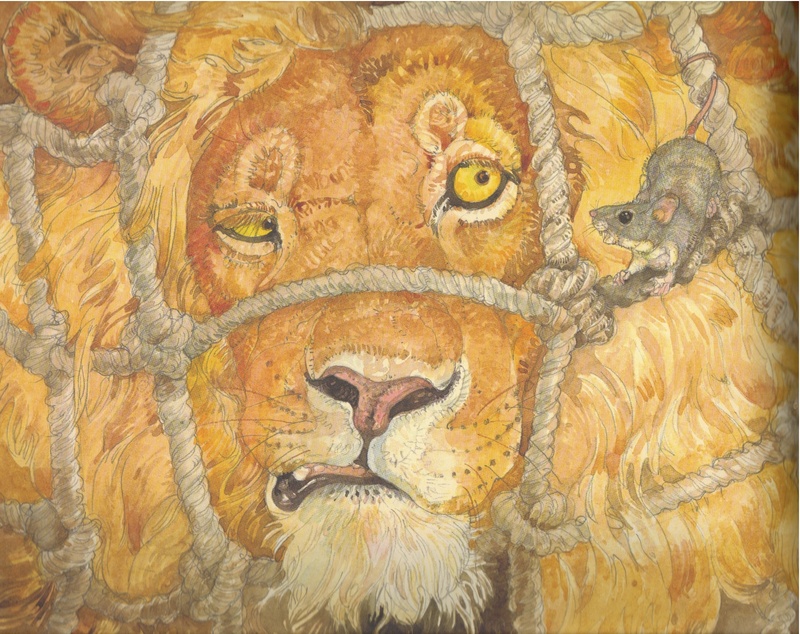 To catch the big moment when Lion rises up and grabs Mouse, we went with "Out of Limits" by the Marketts, from 1963. It starts with a cool "Twilight Zone"-ish piece that's seems just right. (A little too just-right for Rod Serling, creator of "The Twillight Zone," who sued the Marketts for copying it). We had this one fade out at about the 0:55 mark. 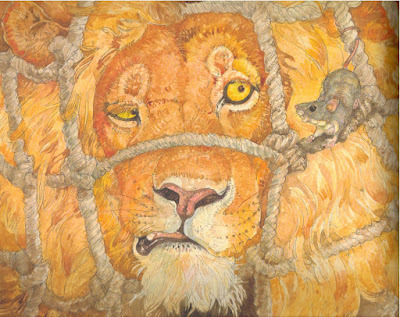 In the book, that's where Mouse has been released and Lion strides off triumphantly. When the illustrations shift to the Hunters, we went with "Peter Gunn" by Duane Eddy from 1959. It was the theme from a detective show that ran from 1958-1961...the music on the show was done by Henry Mancini, but we went with Duane Eddy instead. It has a great guitar opening to announce the Hunters, then a saxophone that's just right for bad guys. 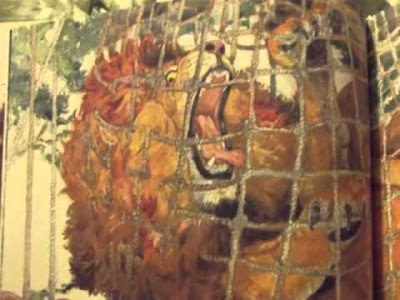 The first 0:55 worked about right, starting with the Hunters' jeep and ending with Lion suspended in the net. For the rescue, we played "Walk Don't Run" by the Ventures from 1960, (often considered the first major hit in the surf music genre). A nice drum opening transitions to the mouse neatly, then the guitar part runs through Mouse's chewing of the ropes, and has a nice break at 1:05 to match the final thread. 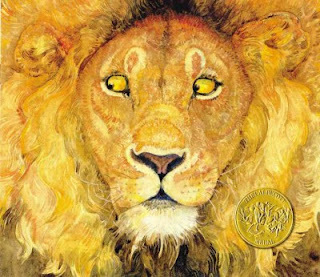 When Lion is finally free, we jump forward to 1972 for "Joy" by Apollo 100 (or you could say we're going back to the 1700's, since this was inspired by a piece by Johann Sebastian Bach). We skipped the first 0:24 and faded out at about the 1:09 point. 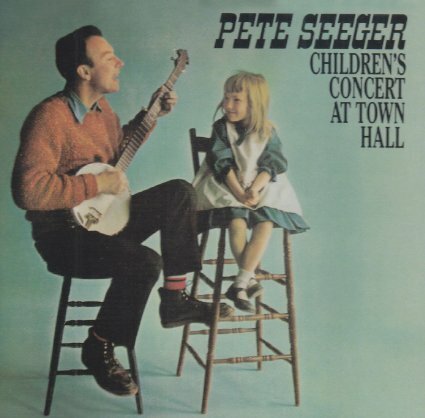 This has a different sound than the early 60s stuff in the middle, but it seems appropriately triumphant, and it fades as the two families walk off across the endpages. With a music/scan version like this, it can take some time to get it all together. Messing around with songs, downloading them into your PowerPoint file, and getting the timings and the fading to work pretty well takes some time. But after you get it right (or as close to right as I ever strive for), the actual presentation is just introducing the book and clicking on "run slide show." 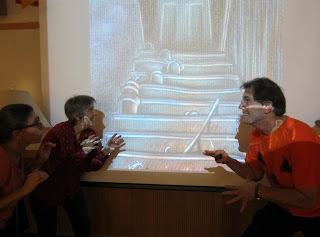 When we played it in Storytime, the music really did help pace the story, but it didn't interfere so much that the kids weren't following the visuals. 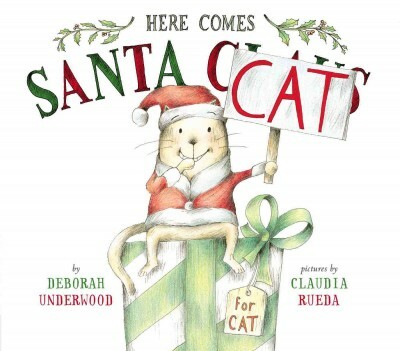 So the book was still the main focus...but if a few families leave storytime with a bit of the Ventures or Bach rattling around in their head, I'm okay with that. 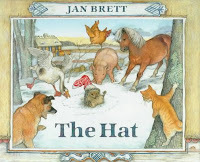 Brad and I chose to use Jan Brett's The Hat for a "clothing" themed Family Storytime. Jan Brett's website has a bunch of great resources for teachers and storytellers, including neat and simple printouts for the animals from The Hat. 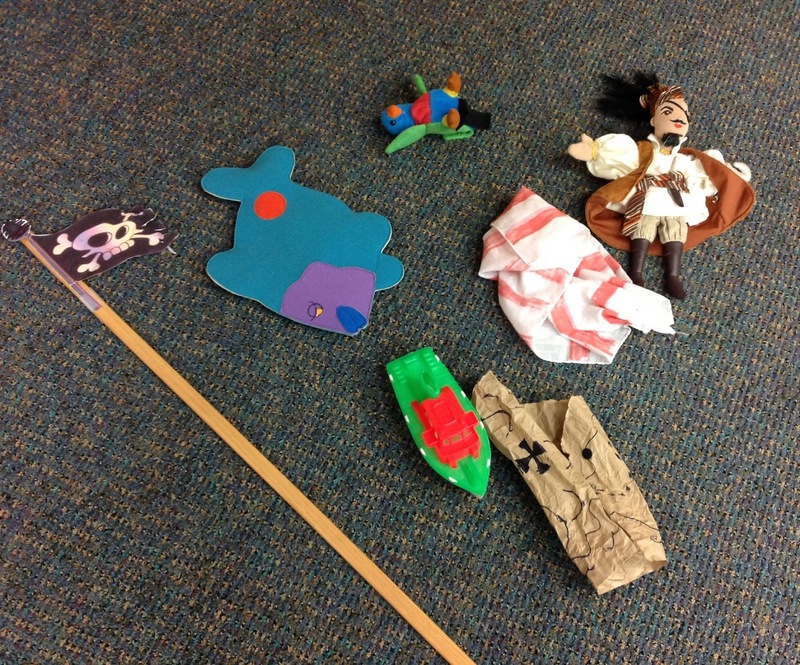 They're designed for reader's theater, but we used them in a slightly different way. We printed out one of each, laminated, and strung some yarn through for the kids to wear. Then we strung a clothesline across the stage. 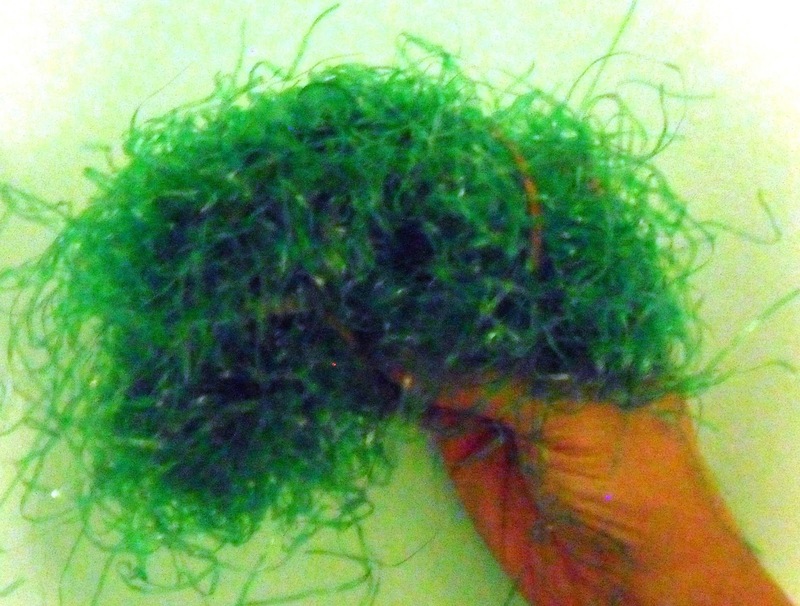 We just tied string to two our our backdrops, but I'm sure there are other ways to work that out. The story is pretty simple, and we simplified it a bit more to make it work with child volunteers. Each of the kids got an animal sign and stood beneath the empty clotheline. Brad narrated while I managed kids and clothes. One by one, I pull each piece of clothing out of a basket and hang one above each animal. Then Brad describes how the sock blew off an fell on Hedgehog. And I unclip the sock and place it on Hedgehog/Child's head. 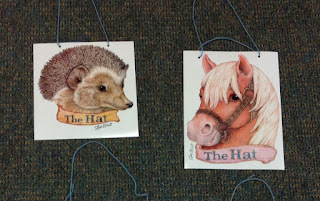 Then it moves to the other animals seeing Hedgehog's cool "hat," and wanting one for themselves. And one by one, the animals spot the clothes above them and I put each one on their head. We considered not revealing the clothes until it was time for each child to "wear" it....keeping the shirt in the basket, for example, until it was that animal's turn for a hat. It actually was much more fun to have all of the clothes in sight from the start, though. You could watch it all dawn on the audience in different stages, as they anticipated that each child would soon have a silly hat. The child volunteers went through the same process, as they put the pieces together and realized what they were each about to wear. Of course, leaving the underwear for last build up the suspense even more. I really wish we'd taken a photo of the kids, before the "hats" and after, but I think you can imagine it. The story ends with me coming to take down the clothes, spotting the silly looking animals, and collecting the pieces one by one. This is one of those stories where the props and the kids really make it work. Though Brad and I split up the narration and child/prop management, those could easily be done by one person. So all you really need is a clothesline, a color printer, and some cute kids. For a pirate-themed Family Storytime Sheila and I decided to do this reworking of "There Was an Old Lady Who Swallowed a Fly" using puppets, props, and a puppet stage. Sheila was in front of the stage managing props and leading the song. I was behind with a pirate puppet. 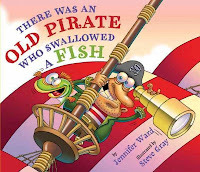 We adapted the book a bit, reducing the number of items that the Pirate swallows and playing around with the rhymes a bit. We started out with all of the props velcroed to the side of the stage, which worked well: they were handy for Sheila to grab, plus it led the audience to anticipate what would be next. We sort of traded off with the telling/singing of the story. I would start off with "I am an old pirate, I swallowed a.....Fish!" Then Sheila takes the Fish, holds it above the pirate puppet, and slowly lowers it into the puppet's mouth. The pirate turns to face away from the audience so that it kind of looks like he's really swallowing it. 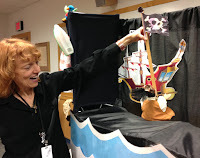 Sheila then leads the audience through the cumulative part: "He swallowed the Sail right after the Parrot / He swallowed the Parrot right after the Fish...." As the Pirate I joined in each time it got to the refrain of "Arrgh and blimey, that Fish was Slimy!" and then again with the final line of "Yo ho ho, Watch his belly grow!" We didn't worry too much about having perfectly matched props. The Map was a rolled up drawn paper map; the Sail was fabric that Sheila decorated. The Mast was a fun one, because it was so long. 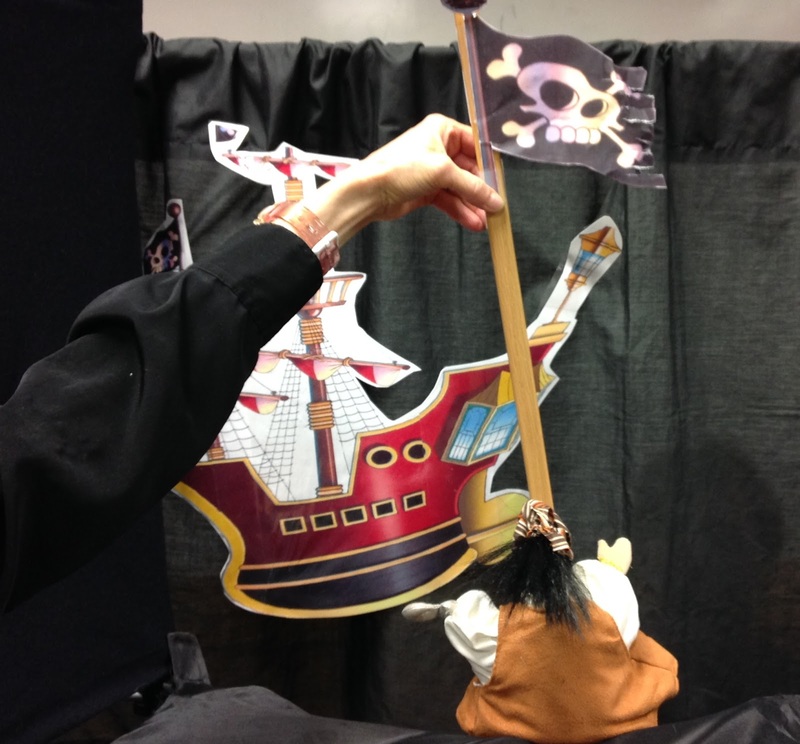 In the book, the Boat is an actual pirate ship, but our simple plastic toy boat worked fine. As Sheila put the props down the Pirate's throat (or pretended too) I would catch them with my off hand so they wouldn't crash to the ground. Or at least I mostly did: I missed the boat once and it was pretty loud. 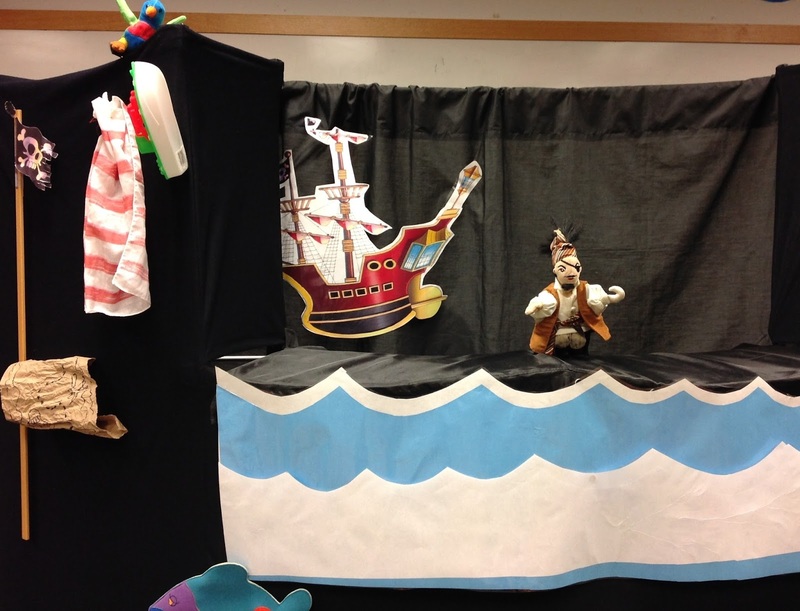 At the end of the story, the Pirate sinks to the bottom of the sea. So I sang that verse and slowly brought the Pirate out of sight and turned on the bubble machine from behind the stage. It always seems to be tricky to get the timing of a bubble machine just right. Sometimes they start up right away, sometimes it takes a bit. 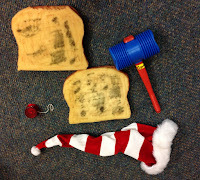 But for the most part this effect worked well and the kids got the idea. We also had a bubble sound effect that started with the click of a PowerPoint slide. Well, two out of four times it started...not sure why it didn't work the other times. It's nice to add effects like that, but also good to not make them crucial to the success of the story. We can live with the bubbles being a bit late, but the Pirate puppet, the props, and the telling are what really make it work, and we were four for four with getting those mostly right. We originally thought of doing this as an act-out, with one of us as the pirate stuffing the props into an over-sized shirt, but in the end I think the puppet stage version worked more neatly than the people version would have. We do a Pirate-themed Family Storytime every year, but it's been a Terri/Brad presentation for several years. This time Sheila and I took a turn, and I thought back to my first pirate event, which was probably 20 years ago, and a book that's out of print now but was one of the few pirate early readers on the shelves back then. 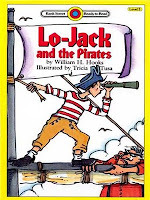 Lo-Jack and the Pirates is sort of like Amelia Bedelia: Lo-Jack is hijacked to be a pirate's cabin boy and gets everything wrong. 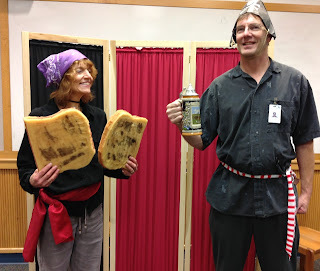 The book is great for 1st and 2nd graders, but younger kids miss some of the puns, so we simplified a bit for our mostly-preschool audiences and acted it out with a few props. Pirate lingo: "Pirates say aye-aye! ": Lo-Jack holds two goofy looking cut out "eyes." Get it? Most of the kids did, though not all. Pirate songs: "Yo ho, yo ho, a pirate's life for me": Lo-Jack gets a yo-yo and sings "Yo yo, yo yo, a pirate likes to play." Then gets a Santa hat and it's: "Ho ho, ho ho, a pirate Santa Claus." Pirate jobs: "You can be a look out and shout "ahoy" when you see land. 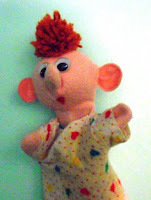 : Lo-Jack steps on a stool, looks at the audience and shouts "a boy!" while pointing at one of the kids. And of course with each mistake Captain Grimm gets more impatient. When he says "Blow me down! ", Lo-Jack tries to blow him over; Captain G. says he's too small to blow down a mighty pirate, so Lo-Jack grabs a squeaky hammer and bops him. When the Captain says it's time to Loot and Pillage the people in the audience, Lo-Jack convinces him that they are nice people and they shouldn't do that. So Captain Grimm turns nice and the story ends with C. G. proposing a Toast to Lo-Jack, which is when Lo-Jack grabs a couple of pieces of toast. The humor really worked just fine for the audience. For those who maybe didn't get the verbal humor, there was enough going on visually with the props and people that it was still funny. Like maybe a three year old doesn't register that Lo-Jack got "yo ho" mixed up with "yo yo" because they sound the same, but knows that pirates don't play with yo yos, and that's pretty funny anyway. Click here for a short, not-well-edited video clip we did as a sample. I keep trying to get back to this blog, and my motivation this time is to get in a good Halloween story before the holiday happens. This a favorite among pre-school teachers and librarians, but not everyone knows it. 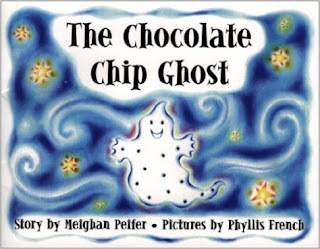 I've pretty sure that I've never actually seen the book: I learned it as a felt board story from someone years ago. I don't do many stories with felt, mostly because I'm so completely unskilled at scissors, patterns, and just general crafty creativity. But these shapes are even simple enough for me. 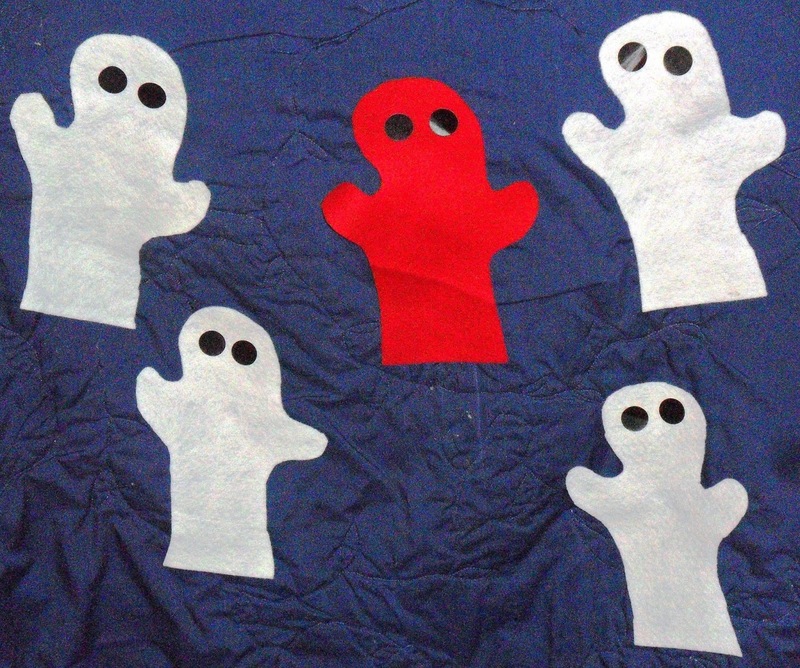 You just cut out five small ghosts and one big one. 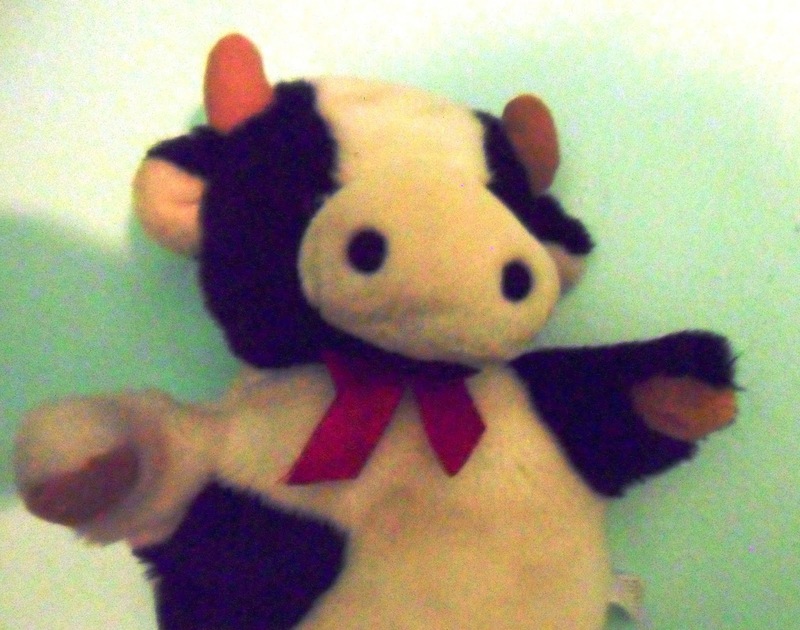 I made the big one into a simple flat puppet, but it works fine as just a felt shape. Mother Ghost goes to the store to get some food. 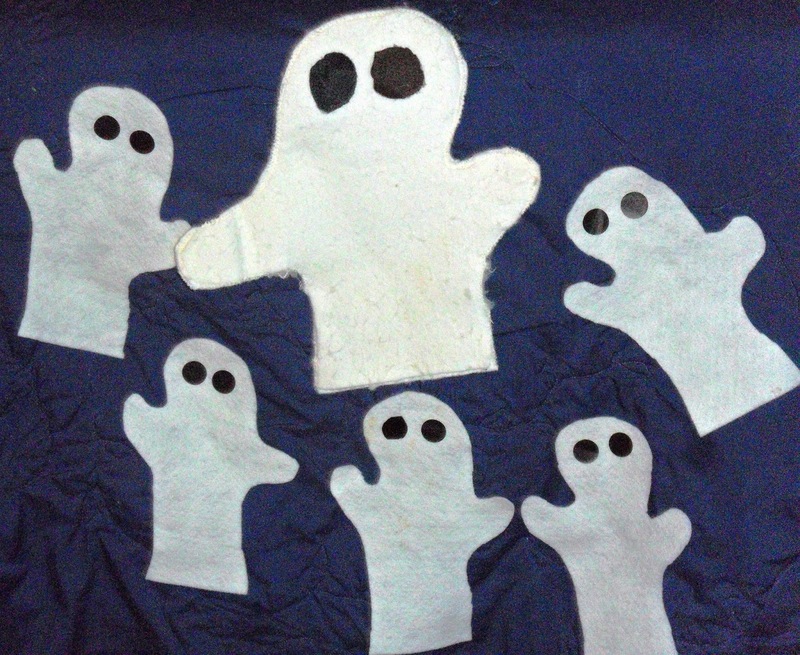 She tells her five little ghosts not to have anything but milk when she's gone. 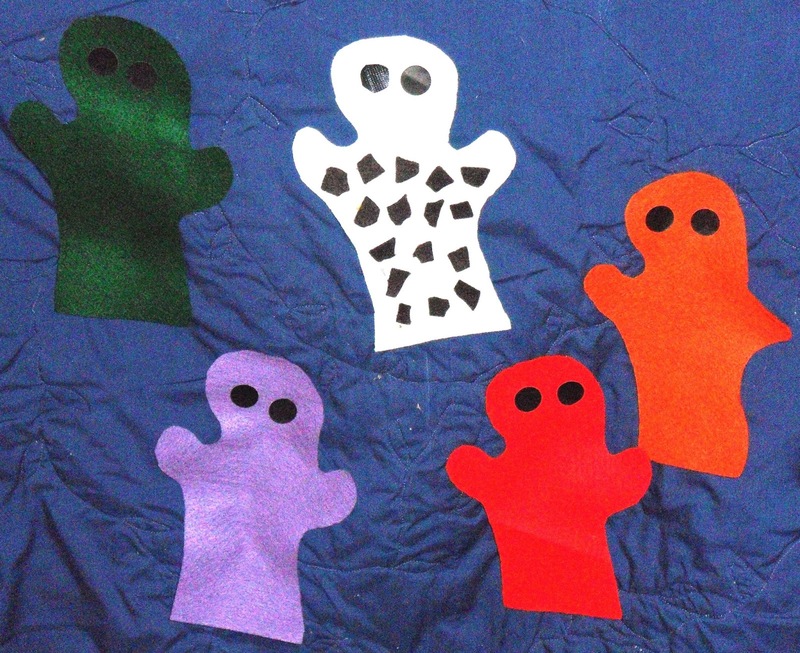 One by one, each ghost goes to the fridge and gets something that's not milk, but something with a distinct color. Ghost one gets a tomato. [pick her up and bring her behind the felt board; show the tomato]. And when she came back, she was......red! [switch white ghost for red ghost and put that one back on the board]. Then then next three ghosts do the same thing, with different colors and different fruits or vegetables. Play food or real food both work fine. 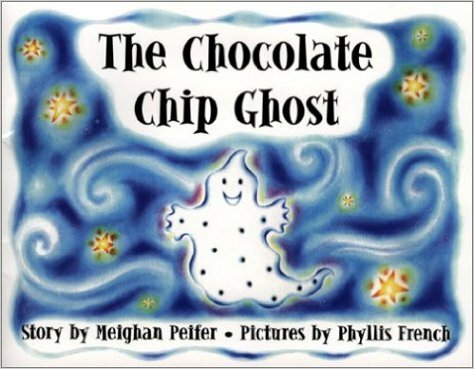 That simple anticipation and guessing game, where the kids guess what the ghost will eat and what color she'll turn to, along with the satisfying visual image of that brightly colored ghost, works just great. Similar in effect to doing Pete the Cat: I Love My Red Shoes with colored shoes. Then there's a neat twist at the end, when the last little ghost finds the refrigerator empty, so she looks in the freezer. I usually let the kids know that she found some ice cream, ask them to guess what flavor, then show the decorated ghost and they all get that it was chocolate chip ice cream. 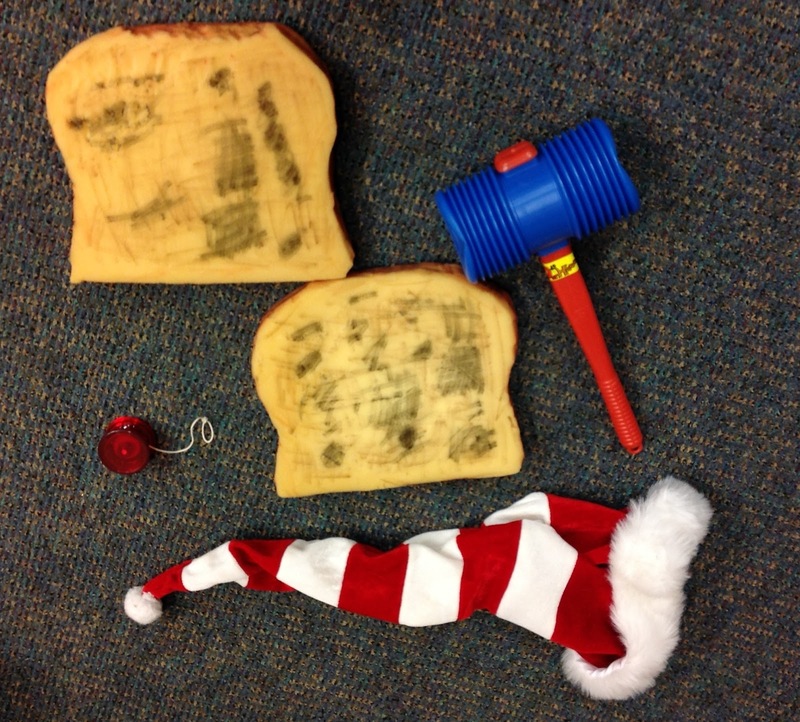 For the food props, you can use real food, toy food, or if you don't have either, just print out a picture. Actually pictures might work even better because you can stick them to the board, though I've never tried it that way. 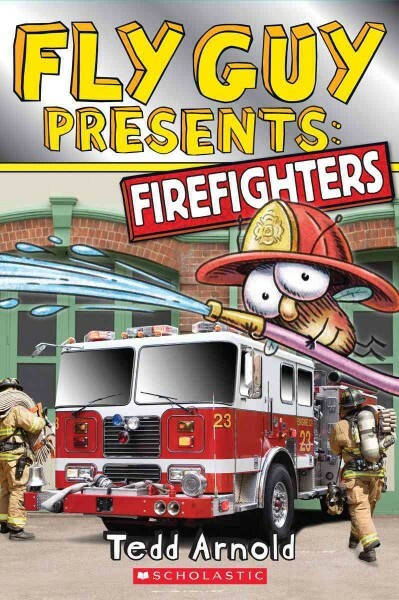 The humor and surprises in this story are right on target for two and three year olds, but it's also engaging enough for ones and surprisingly fascinating to four and five year olds as well. 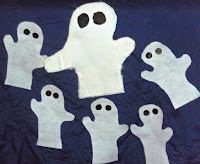 And for toddlers it's has just the right level of Halloweenishness, with the least scary ghosts ever.